Students at St John’s College continue to gain recognition for their business and social enterprise projects and initiatives. These include water-quality and weather-forecasting systems and community-based partnerships. 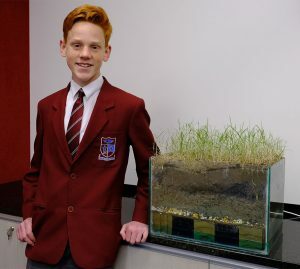 Ayden Wilson, year 10, is involved in developing a water-quality project. ‘George’ is a low-cost device invented by the students and teachers. ‘George’ detects flooding levels for holiday homes and farms and sends an alert to the owner’s cell phone. 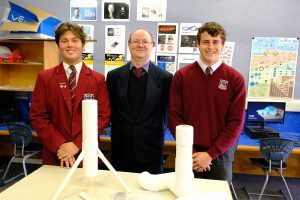 The students’ goal has been to produce the best weather monitoring device in the country as adverse weather patterns in New Zealand and the South Pacific are becoming more frequent. Project directors are continuing to refine and innovate the device. They have a commercial relationship with Ravensdown (NZ). All profits generated from ‘George’ will be gifted to Whatever It Takes (WIT) – Hawke’s Bay’s largest peer provider of community-based mental health and addiction services. “St John’s College was the only school in New Zealand to send a submission to the Government Inquiry into Mental Health and Addiction. The students’ experiences with the marginalised prompted them to send a submission to the Government Inquiry into Mental Health and Addiction this year, the only school in New Zealand to do so. As a result, Inquiry representatives met at the college in June. Chaired by Auckland University law professor Ron Paterson, they heard students and WIT clients speak about the lessons and enrichment that have occurred as a result of this unique partnership. 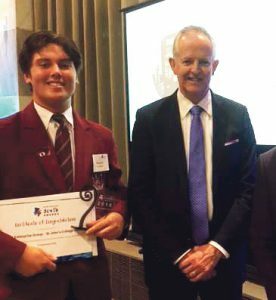 ‘They were very happy with us being the first school in New Zealand to be involved like this and were astounded by what we are doing – in word and in deed,’ said year 13 student Ben Gardiner. 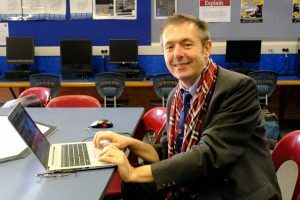 Teacher and project innovator, Mr David Ivory. Teacher, Mr David Ivory, has instigated many of the projects. Mr Ivory and the students are developing a National Poverty Index (2018), which will be launched in September together with the Mayors of Hastings and Napier. 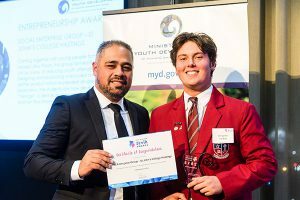 Hon Peeni Henare Minister for Youth presents New Zealand Youth Award for Business and Entrepreneurship to Benjamin Gardiner. The Children’s Commissioner Judge Andrew Becroft and Benjamin Gardiner at Entrepreneurship Awards. Highly commended at the 2018 New Zealand National Commission for UNESCO Award in Global Citizenship Education. New Zealand Youth Award for Business and Entrepreneurship, Ministry of Social Development. National Whai Tikanga Award from Manatū Taonga – Ministry for Culture & Heritage for the use of the arts as an integral part of a tikanga programme to encourage a strong cultural identity and support pro-social living with Hawke’s Bay Prison. Entrepreneurship Award from Children’s Commissioner for work in reducing reoffending by young people.